Hong Kong has become a city saturated with luxury hotels; there is one five-star property after another all promising the stay of a lifetime. Of course, these types of hotels come with price tags that for most people are simply unaffordable. This is why, when I discovered that Swire had a sister-property to The Upper House, which is considered a business and budget friendly hotel, I had to check it out and see if saving hundreds of dollars meant making huge compromises when it comes to style, comfort, and service. A night at the East Hong Kong will only set you back $150, a price that is almost unheard of in major cosmopolitan cities. East Hong Kong is situated amidst the financial center of Hong Kong. From the hotel you can quickly get to any other part of the island, the Mass Transit Railway (MTR), and/or the international airport (HKG). In the surrounding vicinity is some of the best shopping and dining establishments in the city. On the hotel’s second floor there is even a skybridge that connects guests to the City Plaza Shopping Centre. As I made my way up from the modern lobby to my room, I was already incredibly impressed by my glamorous surroundings. East Hong Kong makes the word “budget” look good. Each room in the hotel is filled with custom furnishings and fabrics, which have a sleek and masculine feel overall. My harbor corner room with a view had a King sized bed and was further enhanced by special touches such as a work station and a flatscreen TV. The ensuite bathroom features a rainforest shower that is one of the nicest I have ever encountered. From the shower you have a dazzling view of the city as you scrub clean with an array of Elemis bath products. Throughout Hong Kong you will discover the very best the world has to offer in technology and the East Hong Kong is a perfect example of this. Every room comes with its own iPod-Touch that is fully loaded with music or you can use it to order room service. I asked for a pizza one night and it was delivered to my room in less than twenty minutes. 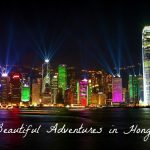 I was blown away with my stay at the East Hong Kong. In fact, I would go as far as to say that it should drop its business and budget friendly label and call itself a luxury hotel. There was zero compromises here. This is without a doubt the best kept secret in the city! As I stayed with family in the vicinity, I passed by this hotel every day on the way to the MTR station, and I was always curious to know what the hotel was like. It’s great to know the room and service were completely worth the price. Did you also check out their rooftop bar, Sugar? Now, that’s a great view, too, to go along with a drink or two! Oh my goodness, I loved loved loved Sugar!!! I spent much time there haha. East is an AMAZING place! I could definitely spend a couple nigh…..months at that place! That definitely doesn’t look budget – a great spot without any compromises! That price is amazing for the location, and with such great style it’s almost unbelievable! What a steal. Total steal, seriously it might be my favorite hotel in the world, because of what you get for the price!!! WOWWWWW! I love this hotel..the shower is amazing!!! I can confirm that $150 is a total bargain for Hong Kong – hotels are very expensive there. Good find Andi. I really think Preferred Hotels, and Summit hotels have great properties everywhere. WOWWWWWWWWWWWWWW i cannot believe that is listed as a budget friendly hotel it looks way way too snazzy haha!! i love love giant bathrooms with overhead rain showers.. and elemis products DIE!! Isn’t it amazing!?! Seriously I’m so crazy in love with this hotel, I hope as they get more popular that they keep their rates about the same. I especially like the iPad in every room! Hong Kong sounds amazing! The iTouch was AWESOME!!!!!! Hong Kong is such a great place! This hotel looks wonderful, especially the shower! I’ve never had the chance to try a rainshower shower head–so jealous! And iTouch to order room service? Amazeballs! I’ve never heard of that before. Oh darling you simply must try a rain shower head!!! It will change your life! And yeah, the iTouch…incredible! Yes! The view was one of the best parts about the room. Hope you end up staying there Will, you’ll love it! 30 years of adventures…I like the way you put that! I didn’t even think about turning 30 that way and I should have!!! Your life sounds pretty fabulous darling! Thanks for the tag, I’m quite honored! That shower head is amazing! My husband has gotten to install it in a few projects. Jealous! It was sooo amazing!!! I want one in my own home! And I want to go back! I HAVE to stay here one day! I love those kinds of pleasant surprises! This place looks absolutely beautiful! You always get to stay in the most amazing places – this looks fabulous! Thanks love, this place was super fab!!! Wow what a cool, cool place! Only 5 more months until I head over to Hong Kong. I might want to give this hotel a try. Reading about your Hong Kong trip has been building my anticipation like crazy! I am sooo excited for you! I really, really recommend this place. I know they will take VERY good care of you. Nice looking room, the shower looks interesting. You always stay at such fabulous places Andi!!! Oh I stayed here on a biz trip and LOVED it! What an awesome place, I have to check it out! It’s truly a nice and helpful piece of information. I’m happy that you simply shared this useful info with us. Please keep us informed like this. Thank you for sharing. I just loved the shower and the room, inviting for a great rest. I have been to HK Andi but didn’t know about this place haha. Yeah, the room was utter perfection! Next time you’re in HK make sure to stay there for at least one night!!! Awesome looking place, what a view! Individuals underestimate how much you want rest! Everybody sleeps. Few are fortunate to relaxation and rejuvenate overnight. The whole lot you do in life you do higher with a better nights rest, I believe you can get the rest of your dreams at this place! I think you’re 100% correct! This looks like such a place of luxury! Your website is so awesome! What a hip place to stay!